UPDATE:11 FEB 2O12, A SECOND LAWYER, MR. YARI FROM “FUTURE IALA” STARTED WORKING ON MOHAMMADREZA’S BEHALF SINCE LAST NIGHT. THE ORDINARY LAWYER SENT A SECOND APPEAL CHALLENGING THE MIGRATIONS OFFICE LATEST REJECTION. 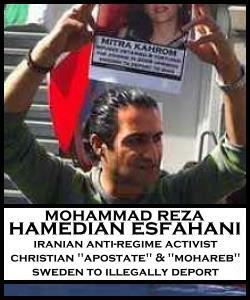 UPDATE: 10 FEB 2012, THE SWEDISH GOVERNMENT (MIGRATION OFFICE) DENIED THE APPEAL FILED BY MOHAMMADREZA’S LAWYER TODAY. A NEW LAWYER IS BEING SOUGHT. IN THE MEANTIME, IT IS URGENT THAT EVERYONE SEND A LETTER OF PROTEST TO SWEDEN’S MIGRATION OFFICE (INFO BELOW). WE HAVE ONE WORKING DAY LEFT TO STOP THIS CRIME.DEPORT DATE: 14 FEB 2012. The Swedish government once again intends to illegally deport an Iranian human rights activist and convert to Christianity (punishable by death in Iran) back into the hands of the Islamic Republic. This post provides the story and background documents for Mohammadreza Hamedian Esfahani and his family, and we have drafted an open letter to Sweden’s Minister for Migration and Asylum Policy protesting this illegal and lethal deportation to Iran. Please contribute by urgently participating in the letter-writing action, below. Mohammadreza and his family – his wife and two young daughters – are 4 of Swedish Migration Minister Tobias Billström’s latest victims. Mohammadreza and his family arrived in Sweden in September 2008 and sought political asylum. The reason this family fled Iran was like that of many others who in great numbers convert from Islam to some other religion. Mohammad Reza believes that he owes the life of his daughter to a miracle, and that Jesus played a role in this. In December 2007, he and his wife and daughter converted from Islam to Christianity in secret in Baku, Republic of Azerbaijan, in the Russian Protestant Church. Mohammad Reza’s conversion remained a secret for a very short time, until he started advocating for his new belief. His problems, including harassment by the workplace security “Harasat” authority, started soon after. Mohammad Reza and his family were forced to seek safety in a place where no one knew about their conversion. In Tehran, they were informed that he was tried in his absence, found guilty of apostasy and propagating against Islam, and sentenced to 10 years in prison and 75 lashes. 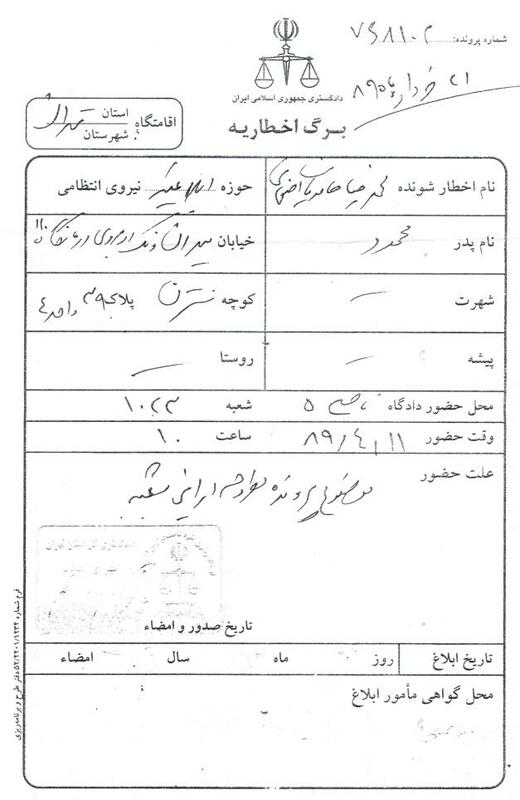 The Islamic Republic’s official documentation of these charges against Mohammad Reza, and his sentencing, appear below. The court has reviewed the content of the file and declares the end of investigation and examination and proceeds to issue the decision. According to the indictment letter of revolutionary attorney general’s office of the 5th District dated 2 Shahrivar 1388 (Gregorian date 24 August 2009) Mr. Mohammad Reza Hamedian Isfahani, son of Mahmoud, is sentenced to propaganda and spreading of lies and opinions against the sharia of the Islam and based on the witnesses report, he is accused of apostasy from Islam and the Court recognizes him as an apostate and Mohareb (one who wars with God). According to Islamic penal codes, on the apostasy charge he is sentenced to 10 years in prison, and on the propaganda against Islam charge he is condemned to endure 75 lashes. The sentence issued in absence can be appealed within 10 days after notification in this court and other instances can be appealed within 20 days in the revolutionary appeal courts of Tehran. 2- Summons for Mohammadreza Hamedian Esfahani to appear in the court (ehzahrieh). According to the case reference number, if you do not attend, the court will proceed and pass judgment and pass sentence in your absence. 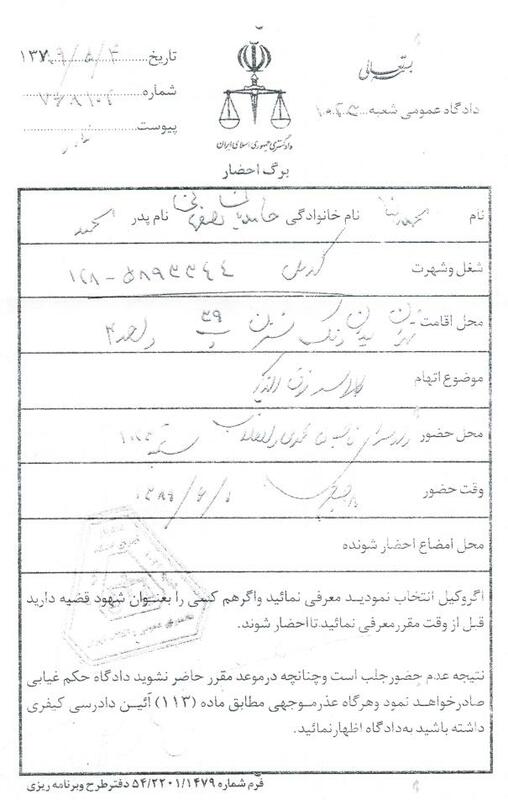 3- Subpoena or decree of warning for Mohammadreza Hamedian Esfahani to appear in court (ekhtarieh). 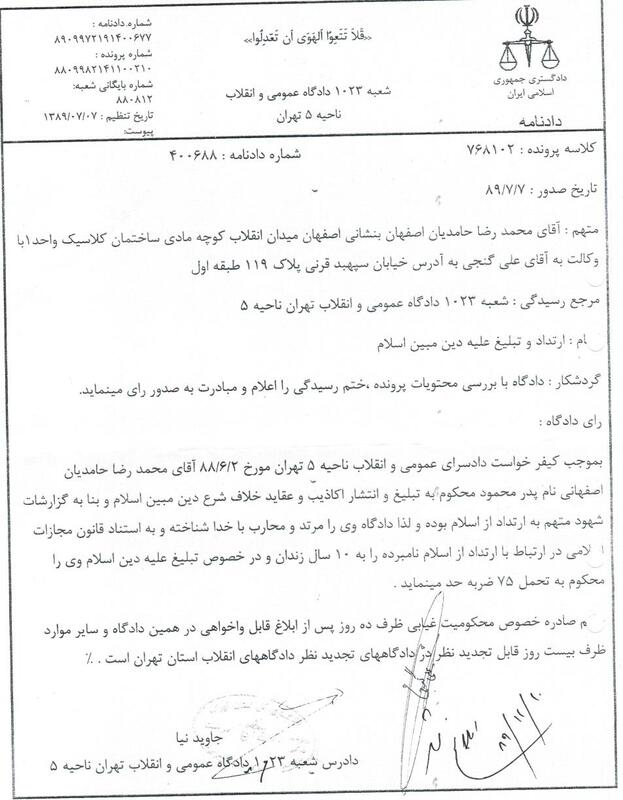 Warning to Mohammadreza Hamedian Esfahani (father: Mahmoud) that he must present to the branch court for the above-referenced case on Persian date 11 Tir 1389 (Gregorian date: 2 July 2010). In light of the grave consequences that await Mohammadreza and his family if he should be deported – both due to the pending “apostasy” sentence, a quintessential “crime” ofconscience, and due to the fact that Mohammadreza has participated in numerous public demonstrations against the Islamic Republic regime – we urge everyone to urgently submit a letter to the Swedish Migration Office in protest of Mohammadreza’s deportation. A sample letter is provided below. Please act quickly as there are only 2 working days left until Mohammadreza’s deportation date of Tuesday 14 February 2012. Please urgently copy/paste this or your own version & add your own signature to the webforms for contacting Tobias Billström, Swedish Minister for Migration and Asylum Policy and his Press Secretary Linda Norberg. Thus it is well-established that, in addition to documents from the Islamic regime demonstrating its intent to severely punish Mr. Esfahani for converting to Christianity, Mr. Esfahani has additional well-founded fears of persecution by this regime on the basis of his honorable political activism in support of human rights and against the barbaric regime in Iran. Mr. Esfahani meets all criteria for formal recognition as a refugee; it is thus illegal to refoule him. Article 33 (1) of the 1951 Convention relating to the Status of Refugees, which states that: “No Contracting State shall expel or return (‘refouler’) a refugee in any manner whatsoever to the frontiers of territories where his life or freedom would be threatened on account of his race, religion, nationality, membership of a particular social group or political opinion.” Sweden, as a signatory to the UN Convention and Protocol Relating to the Status of Refugees, is required under this convention, and consequently under jus cogens international law, to comply with the inalienable rights of refugees to asylum, protection and no forced return to their country of origin. We therefore demand an immediate halt to the illegal refoulement of Mohammadreza Hamedian Esfahani. Yet despite this finding, the Swedish government continues to deport Iranian activists like Mohammadreza Hamedian Esfahani and others, who are clearly and undeniably at risk not only of detention and torture by the Islamic Republic of Iran, but at unquestionable risk of execution. We demand an urgent, immediate halt to Sweden’s intended illegal refoulement of Mohammadreza Hamedian Esfahani, who will certainly face torture and is at clear risk for execution if returned to the Islamic Republic. Given the the Migration Office’s blatant, repeated violations of refugee rights that risk the lives of Iranian and other asylum-seekers, we demand that Sweden must not only immediately halt the illegal deportation of Mohammadreza Hamedian Esfahani, but must immediately cease all deportations to Iran. be omide azadi mohamadreza hamedian esfahani. gereftane eghamat haghe 1 panahande mibashad,…..
chera doroogh minivisi ,vaghti dadgah raay mide madeye marbootaro minivise,inke to baraye khodet joor kardi noskheye hakim bashiye!! !mikhay panahandeh beshi gigool!! ya parvandeye dige hesabi joor kon!! !hamatoono sare kar gozashteh.in baziya dige ghadimi shodeh! With recent event Youcef Nadarkhani, a 32-year, was arrested in October 2009 and later sentenced to death for converting to Christianity buy Islamic Regime in Iran I am very surprised Swedish governments with long standing for human right is going to deport this gentleman knowing what will happen to anyone who has converted to any religion. Doostan dorooghe in bargeha maaloome kamelan,nahiye dar iran yani dadsara,dar hali ke dadgahaye keyfariye tehran dar mojtaamahaye ghazayi mostaghar hastan,in shobe dar in nahiye mostaghar nist,ba moraajee be sithaye ghoveye ghazaiyeye iran,mahale daghighe in dadgah maloom mishe mesle saithaye marboot be vekalat dar iran,aziz joon jedan to ki hasty? ?asle ghaziyaro begoo lotfan.be shomareha va tarikh e ehzarha va sodoore raay tavajoh konid.ta in forsat talabha natoonan khodeshoono ja bezanan.baraye edareye mohajerat e mail bezanim. je pense c`est pas papier origine parce que les parques en Iran se sont situes ensemble qu`on dit nahiyeh,et les tribunaux sont ensemble ils ne sont pas dans le même bâtiment avec les parquet . après attention aux dates et autre chose ,je ne sais pas vraiment ce qui??? free free free Mohammadreza Hamedian nu nu nu. never diport Mohammadreza to Iran. In any case this Iranian asylum seeker should be recognize as refugee. Reasons are clear: 1- his convert 2- his sur – place activities.